Given the economic fallout of the past couple of years, there has never been a time in recent history when so many prospects are looking for a new advisor. In today's hyper competitive landscape, you need to find unique ways to differentiate yourself from the competition. The old methods do not allow you to demonstrate relevant value to your clients, and are not very effective any more. In this fun, informative presentation, marketing guru Marie Swift will share stories of advisors who are gaining market share through online visibility and digitalmedia strategies, public relations and credibility marketing, purpose-driven prospecting, event marketing, niche strategies and much more. Don’t miss this fast-paced session as Swift provides simple yet effective ideas that can propel your firm to the next level of success! Swift is a well-known marketing consultant, speaker and writer in the financial planning industry. Her firm, Impact Communications, provides marketing strategy, public relations, and related services such as copywriting, book production, speaker promotions, graphic design, etc. to financial institutions and independent advisors nationwide. 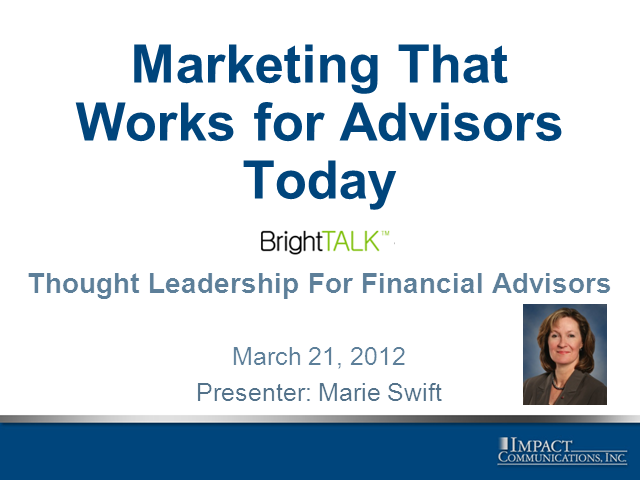 Swift’s Marketing Maven column publishes every Monday morning on www.Financial-Planning.com. Additional insights are available on Swift’s own blog, www.MarieSwift.com. Marie Swift, President, Impact Communications, Inc. Presented by: Marie Swift, President, Impact Communications, Inc.